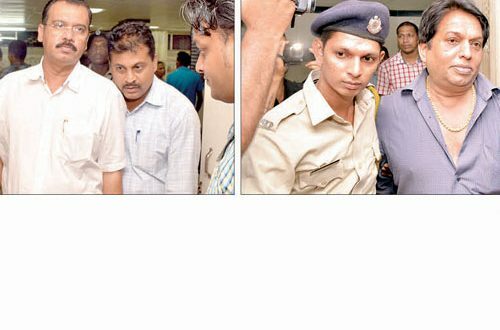 PANAJI: The economic offences cell of the Goa police probing the alleged misappropriation of Rs 3.13 crore of the Goa Cricket Association arrested its president Chetan Desai, secretary Vinod Phadke and treasurer Akbar Mulla on Wednesday evening. The accused have been arrested on various charges including impersonation, forgery, cheating and criminal conspiracy. Soon after their arrests Desai, Phadke and Mulla were taken for medical examination at GMC. Desai and Phadke, who complained of uneasiness, were checked up by doctors. They will be produced before a court on Thursday for seeking remand. The police, who suspect prima facie involvement of the three accused in the case, will investigate the case from all angles. Sources claimed that arrests of the accused were needed as they reportedly did not cooperate with the investigating agency when they had been questioned in connection with the case. “Custodial interrogation of the accused is necessary so as to get more details pertaining to the case. The accused have claimed innocence. However, there are certain queries to which their answers are Said to be unconvincing,” claimed a source. The police said that as per bank documents Desai, Phadke and Mulla are said to be the signatories (as president, secretary and treasurer respectively) and their identity proofs were submitted while opening the account illegally in the name of GCA. The incident was reported to have occurred between 2006 to 2008. At that particular time, Dayanand Narvekar was the GCA president, Desai was secretary and Phadke was the treasurer. Incidentally, as per the records of the GCA for the said years there are no particulars of any such transactions, the police said. A cheque of Rs 2.87 crore received from the Board of Control for Cricket in India was deposited in the account and money withdrawn subsequently. They have also been accused of withdrawing Rs 26 lakh from another bank account on the name of a non-existing person on the pretext of giving the money to a company which had never been given, the complainant Vilas Dessai, life member of GCA, had claimed. The charges were denied by the three accused who, prior to Vilas Dessai’s complaint, had claimed in their complaint that a fraudulent bank account was opened using forged signatures and Rs 2.87 crore were withdrawn and misappropriated. After conducting a preliminary inquiry, both the complaints were registered, one against the three accused whereas the other against unknown. The police have also questioned some bank officials, especially those who looked after opening bank account. Referring to the complaint, the police had said that a cheque of Rs 2.87 crore was sent by the BCCI to the GCA. The preliminary inquiry into the alleged misappropriation of Rs 2.87 crore has revealed that the cheque was deposited in a new bank account five months after it had been issued by the BCCI. The inquiry has also disclosed that the money in question has been withdrawn through 49 transactions in which self-cheques were issued in the names of some individuals. Rs 15 lakh is said to be the highest amount that has been withdrawn through a single transaction. Except for one cheque, other did not carry full names of the receivers.